If you want just one lens to cover life’s many shooting opportunities, this may be the lens. Its powerful 11x zoom goes from wide-angle (18mm)—great for group shots, landscapes and more—to telephoto (200mm)—great for portraits and bringing the action close. Its equipped with Nikon’s advanced Vibration Reduction (VR II) for remarkable image clarity even when handheld shooting or in demanding lighting situations. The AF-S DX NIKKOR 18-200mm f/3.5-5.6G ED VR II is a powerful, versatile photo and video partner. The AF-S DX NIKKOR 18-200mm f/3.5-5.6G ED VR II is an ideal one-lens solution for DX-format D-SLRs. Its powerful 11x zoom means you can capture just about any shot you encounter or imagine. From breathtaking wide-angle cityscapes and landscapes to action-stopping close-ups, the AF-S DX NIKKOR 18-200mm f/3.5-5.6G ED VR II is adept in a huge range of shooting situations. It is a truly exceptional staple for any photographer’s camera bag. What’s versatility without quality? 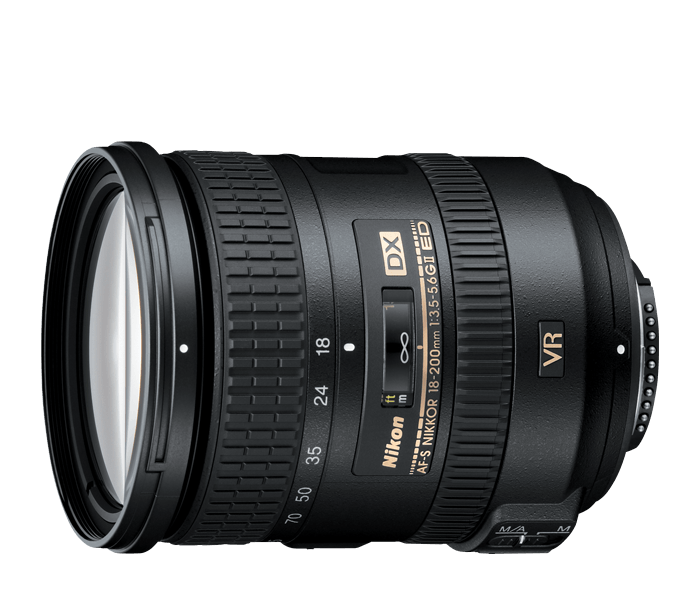 The AF-S DX NIKKOR 18-200mm f/3.5-5.6G ED VR II is as powerful as it is versatile. Nikon VR (Vibration Reduction) image stabilization provides 3.5 stops* of blur free handheld shooting, assuring dramatically sharper still images and HD video capture. Extra-low Dispersion (ED) glass elements maximizes optical performance while minimizing chromatic aberration. Nikon’s Super Integrated Coating (SIC) enhances light transmission and offers superior color consistency and reduced flare, and its exclusive Silent Wave Motor (SWM) enables fast, accurate and ultra-quiet focusing.